Their biggest commercial success came late in the decade with a powerful ballad that topped the charts, but Cheap Trick was already established as an outstanding live act that proved to have staying power. So much so they are the only act inducted in the Rock and Roll Hall of Fame this year who is still performing. really put them on the map. Once I got my first ghetto blaster, I used to listen to a lot of music and music shows on LA-107 FM broadcasting from Lethbridge. One night, one of the shows featured an American band and an album who really had more success performing live and away from home. 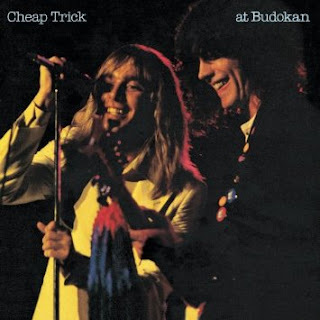 It was “Cheap Trick at Budokan”, which they recorded in Japan on one of their tours. They had some commercial success with singles such as “I Want You to Want Me”. Yet, it was this album that sat at or near the top of the all-time top live albums of all time. It was on “Good Rockin’ Tonite” where I first actually saw Cheap Trick. They were interviewing Robin Zander, the lead singer, and Rick Nielsen, who was the guitar player. What I recall about that was the fact he always wore a baseball cap, and they talked about how that was his trademark. They were promoting Cheap Trick’s newest album, “Standing on the Edge”. The first single, “Tonight It’s You”, still remains one of my favourite Cheap Trick songs of all time. I absolutely loved the song. I would see it again in an odd spot. One Saturday night, at 11:30 p.m., I was flipping channels – which is easy when there are only three – and came upon this music video show. “Tonight It’s You” was one of the songs that played. I don’t recall what it was called, or where it was broadcast from either. The next time I really heard about Cheap Trick was on “Entertainment Tonight”. They had a video, the first one that was closed caption for the hearing impaired. Rick Nielsen was in the bottom right hand corner communicating in sign language while they played. The song was called “It’s Only Love” and off the album ‘The Doctor”. Oddly, a group representing people with epilepsy, complained about the video because it negatively affected their condition. It was the summer of 1985, I think. I was staying with my cousins in Brooks, and we rented this movie we wanted to see from the video store. It was called “Up the Creek” and featured Tim Matheson, a Canadian actor best known to that point for his role as Otter in “Animal House”. He would go on to play vice-president John Hoynes in The West Wing for years. It was a good movie for what it was, a romp like Porky’s or Meatballs. And the theme song, “Up the Creek”, was done by Cheap Trick. I recall my cousin Fred noticing that. I never heard the song again, but it did go to number 23 on the Billboard Hot 100. A couple years later, I was at the tail end of Grade 12, and the sound track from “Top Gun” had been on the charts for months, first with “Danger Zone” by Kenny Loggins, then “Take My Breath Away” by Berlin, and finally “Heaven in Your Eyes” by Loverboy. I was sitting in my best friend Chris Vining’s driveway, in our friend Dave’s truck waiting for Chris. Something was jabbing me in the leg. It was a tape – the soundtrack to “Top Gun”. I always found it interesting to read the backs of soundtracks to see what was there beyond what we heard on the radio. Sitting there were a few songs by notable artists, most notably “Mighty Wings” by Cheap Trick. I have probably listened to that song maybe a half a dozen times. It really never stuck with me, but it did make me think Cheap Trick was still out there performing and making music. Oddly, after thinking that, they would have their biggest single to date. When I was in Grade 12, my brother began to record tapes for me. All I had to do was buy a box of TDK blank tapes, which he said were the best, and he would record whatever I liked on them. One of the albums was “Cheap Trick at Budokan”. That was my real foray into the band, because it was essentially a greatest hits album of their music to that point. I used to listen to it on my ghetto blaster before school, and again before bed. hat yielded the band's most successful single to date. To be honest, I thought I had not heard the radio properly. I was working at Gergeley’s Greenhouse the summer of 1988 after my first year of university. We always had the radio playing in the background, whether in the main greenhouse or in the huge building we built a couple years earlier. I was in that building, working with a girl named Shiela who had been one grade ahead of me in high school at Kate Andrews, when I heard this fantastic ballad on LA-107. I asked her what it was. She didn’t know. A couple hours later I heard it again, and thought they said it was by Cheap Trick. That must be something else, I thought. Cheap Trick is old. They’re not putting out any more new music, especially something this good. Couldn’t be. I ran into Shiela right after that. I still could not believe it. Vining, my best friend, and university roommate the entire preceding year was up at his dad’s, so I couldn’t ask him, and he always was on top of these things. The other thing I always did was listen to the radio. It was actually on the drive home that I heard it again. Yes, indeed, Cheap Trick had a new single out, and it was the beautiful ballad I had heard earlier that day. That single, “The Flame” would strike a chord with a lot of people. It went all the way to number one on the Billboard Hot 100, the only number one single they would ever have. Personally it remains one of my favourite love songs of all time. Robin Zander’s voice is just so powerful and soulful. “The Flame” was on an album called “Lap of Luxury” and it would produce a few more notable singles – a remake of Elvis Presley’s “Don’t Be Cruel” and a single called “Ghost Town”. With that, the decade was over – and it had been a memorable one for Cheap Trick. 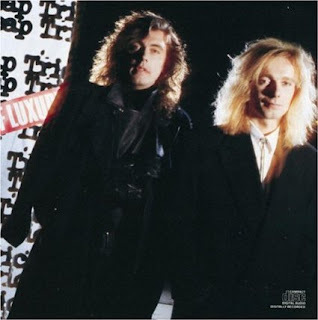 Cheap Trick holds a special place in my heart, something that came after the close of the 1980s. The last year I was at the University of Alberta, I had a highly stressful job. Almost every Friday night I would meet two close friends at the lounge upstairs of Boston Pizza on Whyte Avenue, and we would indulge in a team pitcher or two, depending on the level of stress we all had. That entire year, from September of 1995 until May of 1996, when no one was plugging change into the juke box, the machine automatically played a few albums. One of the albums that played every night was a greatest hits album by Cheap Trick. That, well past the 1980s, was when I really fell in love with Cheap Trick. After all, now I had the best of all worlds. They were a comfort in a year that was pretty tumultuous for me. Even now, when I hear, “If You Want my Love, You Got It”: or “The Dream Police”; “Tonight It’s You”; “The Flame”; or “I want You to Want me”, it brings me fond memories of the only part of a year that was not stressful.